The first competition of the season attracted 15 entries on a cool damp blustery day. The top half of the draw was won by Ollie Speke who beat Pete Driver in the semi-final. In the bottom half, Scott Harries survived a close match with Ruth Garbett before winning his semi-final against Albert Cornes. In the final, Ollie had a bad luck with a couple of accurate fires before Scott prevailed 21-13. Twenty members enjoyed a fine afternoon's bowling in the Club Doubles round-robin. Pool A was won by George Marsh & John Palmer who won all their four games and Pool B was headed by Alec Speke & Matt Ealey who also won all theirs. In the final, George and John ran out winners 15-8. No coats and hats were required on Ladies Day (although one or two still wore a glove) as 11 Ladies played for the cup on a lightning fast green. Irene Wood emerged triumphant with a 21-16 final victory against Judy Morris. Losing semi-finalists were Beryl Steadman and Barbara Eddowes. Irene Wood, Ollie Speke (runner-up), Matt Ealey (winner), George Eddowes. Before the final with Club Captain John Palmer. Twenty two members competed for the Captain's Day Cup on a lovely summer's day. The youngsters prevailed and Matt Ealey beat Oliver Speke in the final. Tom McGill, Barry Walters (runner-up), Brian Walters, Albert Cornes (winner). Fifteen members entered the Challenge Cup with Albert Cornes eventually triumphant with a 21-11 win over Barry Walters in the final. Thanks to Tony Moore for the barbecue and all those who assisted. 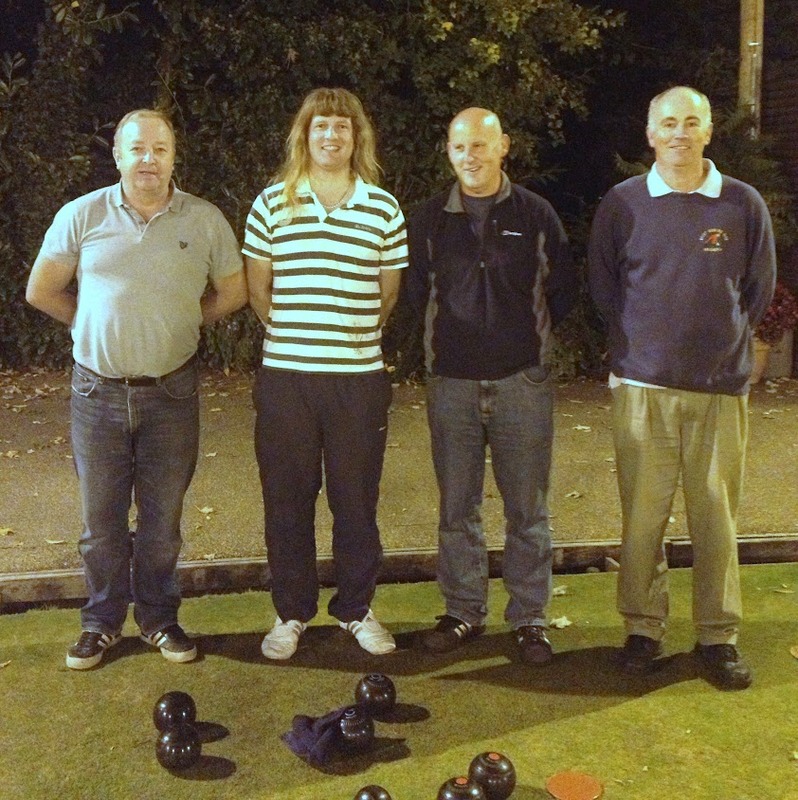 Pete Driver, George Eddowes (runner-up), John Palmer, Albert Cornes (winner). Twenty seven members entered the President's Day Trophy, enough to use both greens. Albert Cornes bowled well again and beat George Eddowes 21-13 in the final. Many thanks to our President Rob Renke for the magnificent tea and to the ladies who prepared it. Finalists: Brian Walters and Scott Harries (Runners-up), Andy James and Tim Ealey. The last competition of the season started on a beautiful early autumn day with the No.1 green running well. Nine pairs entered and there was some excellent bowling. Andy & Tim survived two 21-19 games (Tony Steadman & Geoff Carnell then Albert Cornes and John Palmer) before running out from 16 across against Scott Harries and Brian Walters in the final. Special thanks to Irene Wood for providing and cooking burgers and hot dogs and Terry Hammond for running the bar.